Ten years ago, Delta made history when it announced a merger with Northwest Airlines – a pairing that would create a global powerhouse that is today the acknowledged industry leader. "To many Delta and Northwest veterans, including myself, it seems like just yesterday," CEO Ed Bastian wrote in a memo to employees. "It is remarkable how far we have come since then." The announcement 10 years ago Sunday was just the beginning of a massive integration that brought the two airlines together. The merger became official on Oct. 29, 2008, and Delta and Northwest's operating certificates were merged on Dec. 31, 2009. Since then, the combined Delta has dramatically increased its global footprint, achieved reliability that is the envy of its competitors, and consistently outperforms its peers in customer service and financial performance. Even as competitors responded with their own mergers, Delta's success in the immensely complicated task of combining the two airlines gave it a major advantage. "As the merger took hold, the performance grew stronger and not just in the financials," wrote business columnist and airline commentator Mitchell Schnurman on the merger's fifth anniversary. "Mergers may be painful, but the payoff can be huge if done right." In April 2008, Delta's stock was valued at $7.99 per share. On Thursday, the stock traded above $53. Operating revenue of both airlines combined has grown 20 percent during the decade. Profit-sharing has resulted in record-breaking payouts to Delta people, with more than $5 billion distributed, a feat no other company has ever matched. Meanwhile, average compensation has increased by 80 percent since the merger. Delta is setting the bar for the in-flight experience with the flagship A350 aircraft and an ongoing fleet renewal that is improving efficiency and reliability. Delta's network today is truly global thanks in part to a unique partnership strategy with leading international airlines Virgin Atlantic, Air France-KLM, Aeromexico, Korean Air and others. Delta has invested $7 billion in airport infrastructure since the merger, with another $12 billion coming during the next five years. The investments will allow Delta to design the airports of the future in New York, Atlanta, Seattle, Salt Lake City and Los Angeles. The airline's people-focused culture remains the foundation of the business. The Northwest tie-up was the latest in a history of mergers that have helped fuel Delta's success. 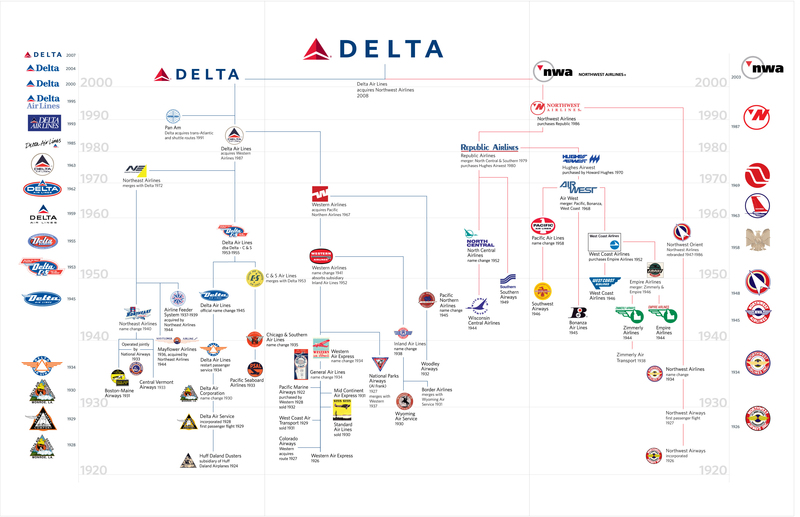 Delta's "family tree" includes Chicago & Southern Air Lines; Western Airlines; Northeast Airlines and the trans-Atlantic and shuttle routes owned by Pan Am. "We are incredibly fortunate to be part of this unique family that was expanded 10 years ago and continues to grow," Bastian wrote in his letter. "I, for one, can't wait to see what the next 10 years bring."